It’s surprising how few people have ever looked through a really good pair of binoculars. Squinting through cheap optics from Walmart isn’t the same thing at all. As glass goes, Nikon’s Monarch binoculars are truly amazing. Plant your eyes behind them, focus them and you’ll find yourself reaching out to try to touch something that’s two hundred feet away. Their flawless lenses and prisms lack even a suggestion of the optical aberrations that are all over the view of low-cost binoculars. Rather than peering through a tube, these things are like watching high-definition television. In choosing binoculars, it’s probably a good start to familiarize yourself with the numbers that always attend their names. In this case, 12 X 56 means that the binoculars will enlarge whatever they’re pointed at twelve times. They’ll do it with 56-millimeter lenses. Higher magnifications – larger numbers before the X – will allow you to see things that are further away, with two important considerations. Increased magnification will allow you to see a smaller field of view, and really high magnification will amplify even the smallest vibration of your hands into a roiling sea of image shake that will have you staggering for the gunnels if you’re not careful. Twelve times magnification is a good choice if you plan to hold your binoculars, rather than mount them on a tripod. Larger lenses will both resolve distant objects more clearly, and they’ll gather more light to allow you to see better during twilight, or in deep shadows. Larger lenses weigh more, all other things being equal, and large lenses made of cheap glass really show their limitations. Nikon doesn’t appear to do cheap glass – these lenses are flawless. The body of the Monarch binoculars is rubber over armor – it’s light, but it feels like it could stop a bullet. It’s also waterproof. It embodies a focusing knob between the two lenses, and a diopter compensation ring to allow users who see the world through eyeglasses to doff their specs while looking afar. This is the first one of these I’ve encountered that actually works properly. …and that’s it. The Nikon Monarch 12X56 binoculars do what it says on the box with a shorter learning curve than the one that came with your feet. They’re breathtaking to use, and they’re built to keep being breathtaking for as long as you and your immediate descendents keep breathing. They’re warranted for a quarter of a century. Monarch binoculars are available with a number of magnification and lens diameter permutations, and in black and camo rubber coatings. 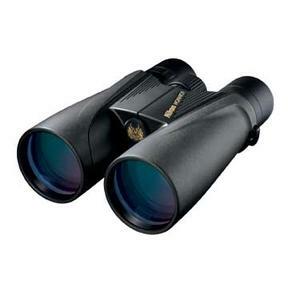 They cost three or four times what economical binoculars will set you back – look through a pair of them and the price will be the last thing you’ll want to concern yourself with.